I'm sure many of you already know that Cafe Makeup blog was shut down. I understand and respect Amy and Liz's decision and know they wouldn't want me (or anyone) to make a big fuss, but I also must say how sad I am. They and the blog are already missed in our small community. I have many posts and projects in the works. If you've been following on Facebook and/or Twitter, you know that I'm working on a makeup brush guide. A really big one. There will also be a Best Of/My Favorites. Have yet to decide if it will open or close the series. Any suggestions? Speaking of Twitter and Facebook, these are really good ways to keep up/keep in touch. I post preview photos (usually of different products for each site), info on upcoming reviews and cat pictures. I love communicating with readers and other bloggers this way. Take note that the Facebook page is a group, not a "fan" page. I would have felt terribly awkward to ask anyone to become a fan. Just join the group and say hi. You might have noticed the revamped "Share" line at the bottom of each post. It allows you to Tweet, mail your friends or post to Facebook when you enjoy something you see here. I'm always delighted when I hear a new reader has found the Non-Blonde because one of his or her friends "liked" my posts. Additionally, there's also the new +1 button. It's a new feature by Google that acts like global "Like" button. If you have a Google account, when you +1 anything you see here (or elsewhere- many sites now let you Plus 1 them) it will show when your friends and contacts search Google for a similar item. Pretty cool, I think. I have a request. It's a net etiquette thing, more than anything. When you leave a comment, please (PLEASE!) don't insert any links to outside sites, even if it's your own beauty blog. The comment section is still part of The Non-Blonde and not a place for anyone to promote products, services or websites. If you're a blogger, there's a place in the comment form for your URL. Leaving links anywhere else is spam and I do not approve these comments. The long promised Dior Addict lipstick giveaway will be on Friday. I have two colors waiting for the lucky winners, 554 and 465. Stay tuned. The next giveaway (after Dior) will be for a beloved Sue Devitt item. More details soon. I'm probably forgetting a thing or two, so I'll leave the rest for you- please let me know if you have any questions and requests. I'll do my best to answer them. 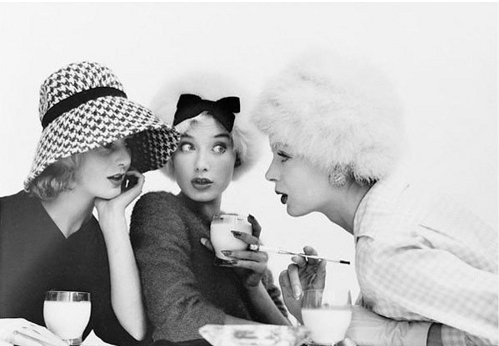 Photo: Norman Parkinson for Vogue, 1952. Thanks for commenting on the closure of Cafe Makeup. I am very sad also. Amy and Liz will be greatly missed. I thought Amy's posts on her trip to Paris were fabulous. Best wishes to both. Hiya! I really hope you do a Fave/Best of perfume project! Stinks 'n Skanks ha! Seriously we have quite similar tastes and you've led me to some of my fave scents of all time. Uber Cheerz from this fan! Thanks for mentioning Cafe Makeup. I was really disappointed to read the last post, and sadden that I couldn't say thanks to them.And, was sorry to see that I couldn't access any old posts for the great information. Rats!!! I really enjoy your point of view and lovely photos. I have been very sad to see Cafe Makeup close their doors. I know they will be greatly missed and I mourn the lose of Amy's fantastic pictures. I cannot wait for the the brush posts, you know I'm always enthralled by your collection. I've no idea how I didn't know about your Facebook group. I shall be correcting this, of course! I don't know anything about what happened at Cafe Makeup--I assume they want to spend more time in the 3D world. Being a new blogger, I realize how time consuming (and even a little addicting) blogging can be. Writing is the easy part--it's getting the right picture that's such a time sink! If I found blogging took too much of my time, I'd probably have to go cold turkey. I will miss their reviews and gorgeous photos, and I hope they are having a fabulous summer. I am really looking forward to your brush epic! Looking forward to your brush guide. I love perfume and lipstick, but my new interest is brushes (thanks to the Unknown Beauty). I just hope that I don't acquire as many brushes as I do shoes. Just a little aside, I do not enjoy Facebook nor Twitter and never follow blogs in these venues. Thank you Gaia, I so appreciate your lessons on fragrance and I look forward to your brush guide. I was saddened as well at the closing of Cafe Makeup and I hope that Amy will create an archive of her posts on one of the free services one day. I wanted to ask about the closing, but I figured your blogging circle had been inundated with questions about the Cafe Makeup site. I tried blogging briefly and I failed. So thank you for staying with us and thanks to Amy for her time with us as well. Yay, I'm glad to hear about the upcoming major brush review! I been trying...and failing...to find a brush I like for gel eyeliner. Can't wait to see your recs. I am a "fan"! I check two sites first thing every morning. Anthro to see if there's anything new I can't live without...there hasn't been for ages...and your blog. Everybody is already missing Café Makeup a lot. I hope you will never let us down, Gaia! Your make up brush guide will be awaited with great anxiety. Anon, I know. The Paris posts were like a wonderful travel journal. I could see and smell everything. Zanne, oh my, a Best Of perfume project is a scary thought, considering my not-so-modest collection and all the stuff I love dearly. I get anxious whenever I do a seasonal list. But you're right- there are several perfume topics that deserve their own little guide. By the way, a couple of years ago I participated in a blogging project "25 best perfumes you can actually find". I'm sure you can find this post when you search the blog. L2S, me too. I already miss it as part of my morning reads. Sunnlitt, thank you! Your support is very much appreciated. Jane,let me know if there are any specific brushes you want to hear about and I'll do what I can. I just ordered the Burberry eye brushes. It will take me some time to test them as well as I should, but give it 4-5 weeks. ZP, blogging is definitely a labor of love, but can still be real labor. I'm committed to this crazy 3 posts a day schedule and have become incredibly efficient in all I do to accommodate it. Still, I know not many would even want to consider it. Xiao, I hope so, too. Evelyn, I think all of us have an item or two purchased solely because of Amy's brilliant photos. Jam, I started collecting brushes about 15 or 16 years ago. I no longer have any shoes from that time, but some of the brushes are still going strong. Jellytea, blogging takes a lot of time and sometimes even money. I love it so much because it's also amazingly rewarding- the interaction with like-minded readers and bloggers is a gift. Thank you for reading :) . Anon(2) I'll have a few suggestions for gel eyeliners in an upcoming posts. Have you tried delicate but wider brushes? Claudia, I promise to always do my best. Sometimes it's difficult, but I have no intention to stop blogging. I hope my brush guide will satisfy most readers. I'm looking forward to your brush guide! I've purchased so many things (brushes included) based on your recommendations. My most recent purchase included a few Sue Devitt eye intensifier pencils - I'm mentioning them to say thank you - because I love them. I'm really looking forward to your makeup brush guide, Gaia. That is sad news. I really give them all my best. Amy was partly the reason why I started paying more attention to Chanel. Also, I loved her shopping in Paris posts. She really made me want to go back to Paris - like I really needed another reason. I cannot wait for the brush guide. I do want to procure more NARS brushes. Adele, I'm thrilled to hear you enjoy your Sue Devitt makeup. The other day I saw that my local Macy's now has a SD counter and was so happy the brand is now becoming more available and accessible. Dain, I'm always interested to hear your thoughts about brushes. Your last post on the subject was excellent. Lexi, I know what you mean about those Chanel posts. The photos on CM were so much better than anything Chanel has ever produced with all their professional photographers, stylists and marketing experts. I was hyperventilating even when the products themselves were once I've tested and rejected because they were wrong for my skin tone. While checking my e-mails I noticed I had not received a new one from cafe makup for awhile. I went to the site and noticed that they were closing shop. I am very saddened that they are no longer blogging, they will surely be missed. Their information was exciting to view. Hope they come back soon! Anon, they're back, even if in a limited capacity. I'm thrilled.